We are talking about an interface that provides as much information as possible for a person to manage efficiently. For example, the dashboard of a car provides information about speed, fuel level, etc. 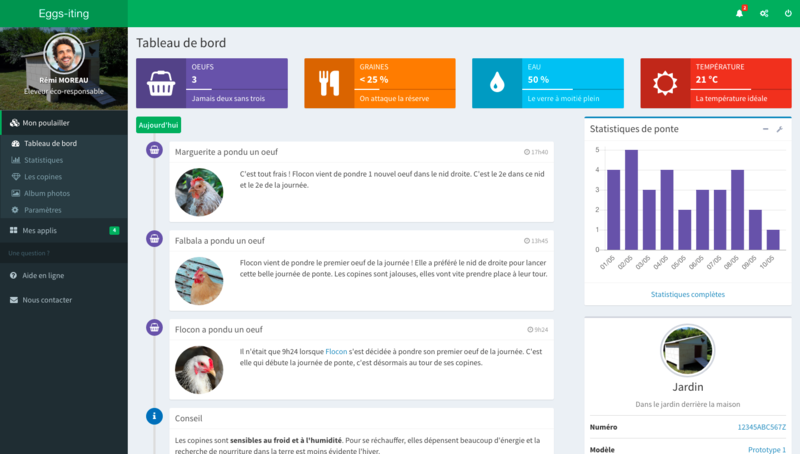 The Eggs-iting dashboard of the Smart Chicken Coop is not a physical object(at the moment anyway ...), it is instead a complete and functional web application that gives you a maximum of information, advice and much more. We want to offer you the best experience possible. 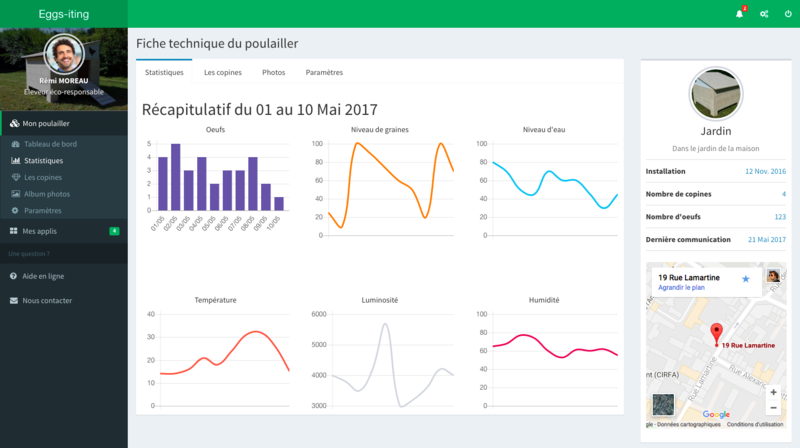 That is why we made several precisions on how to display the data and to give the best user experience (navigation, colors, mobile friendly, ...). 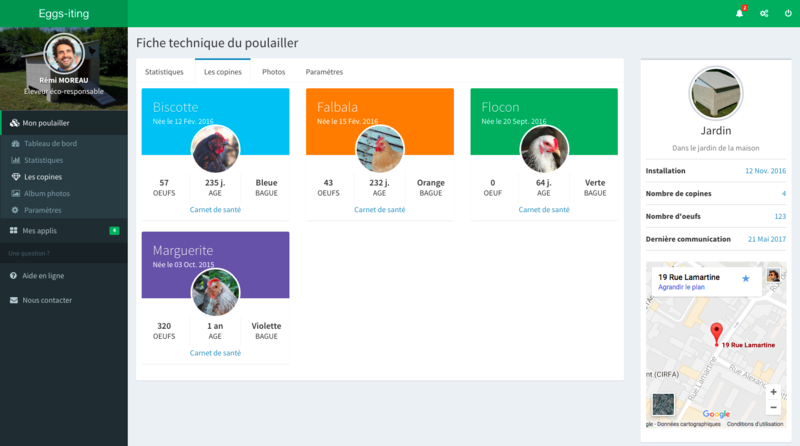 On this first version, as soon as you connect to your dashboard, you will find a summary that displays the number of eggs in the nests, feed level, water level and temperature. Below you find two columns, the one on the left contains the last chronological events (known as a timeline). Its design is reminiscent of the one used by many social networks to which you are accustomed now. To the right, you will find statistics, recipes or any other widget that you will want to display: everything is customizable to best meet your expectations. We have also created a dedicated page for your chicken coop. It includes statistics on spawning, food, water, temperature, humidity and brightness, for example. 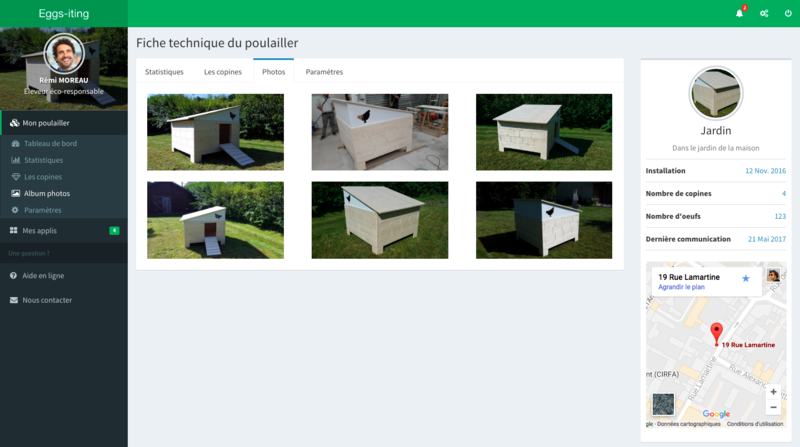 You can also find the list of girlies (this is our way of calling the chickens) who stay in this chicken coop, its photo album and its settings (location, model, name, connectivity ...). In the same way, each of the girlies has their personal health page with data concerning their eggs, their health record, photos and additional data, such as the number and the color of the ring, its name and so on. Finally, we want your experience with the chicken coop to be fun, which is why we are planning to create an application store that allows you to manage your chicken coop and / or play games for the whole family. We'll talk about it later. On the dashboard level, all your family can access the dashboard with a personal account. You assign rights to these people to access specific features. In addition, you will be able to create your account and connect with social networks (Facebook, Google Plus, Twitter or Linkedin), it avoids having an umpteenth password to remember! 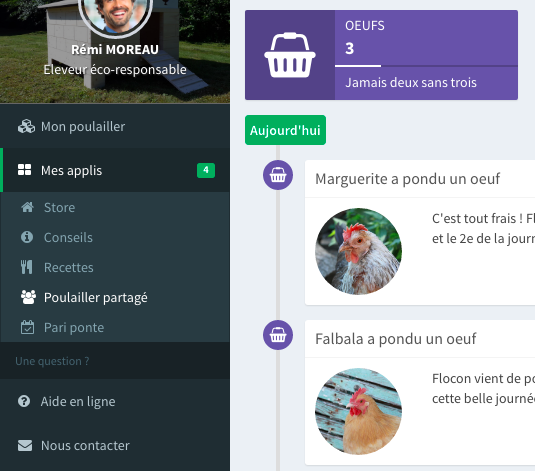 Finally, you can create a circle of friends directly from your dashboard and share information about your chicken coop and the life of your chickens. As we discussed earlier in this article, we want to set up an application store that allows you to embellish your Dashboard with features. The modules integrate perfectly into the content of the dashboard and some offer widgets that you can display in the side columns. Recipes: Recieve recipes according to the number of eggs, according to the seasons, etc. Also, opening the API to all developers will give us the chance to to offer new modules and improvements in the Store. Our first preview of the Dashboard has us excited for more. We have started simulation tests, following the development of the recognition of eggs in the nests. We display in real time the number of eggs and the girlie(chicken) who laid the egg all from the app. All this is done automatically, without ever having to reload the page. There is still a lot of work to do to have a complete and intuitive interface but this POC (Proof Of Concept) promises a very advanced and scalable interface. We will continue work on the different APIs: one that allows your chicken coops to send us information, and one for third-party developers and applications. We will keep you informed of the progress of all these eggs-iting advances in our future posts.